The healthcare facility offer services in medical disciplines of Orthopedics, Neurosciences, Urology, Obstetrics and Gynecology, Physiotherapy, Dentistry, ENT, Aesthetics and Reconstructive Surgery, and Endoscopy Suite and Dialysis Services. We are first of a kind to offer minimal access techniques for Gall Bladder Removal (Laparoscopic Procedure), Inguinal Hernia Repair, Incision / Ventral Abdominal Wall Hernia Repair, Appendicectomy, Laparoscopic Advanced Biliary Surgery, Benign & Pancreatic Cysts, Minimally Invasive Gynaecology Surgery. Our team of experts has treated more than 1.4 million patients across 25+ specialties. Heart failure is a condition in which the heart can’t pump enough blood to meet the body’s needs. In some cases, the heart can’t fill with enough blood. In other cases, the heart can’t pump blood to the rest of the body with enough force. Some people have both problems. Mr Sahib Singh needed treatment for a large bladder mass and an enlarged prostate. He had ignored his treatment to focus on his family's needs. He was unable urinate properly and was in discomfort. He decided to consult a specialist at Max Healthcare. 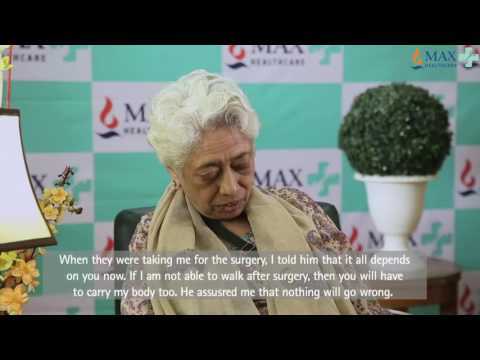 He was hesitant at first about treatment but after hearing Max Healthcare's plan, he was comfortable to proceed with the treatment. 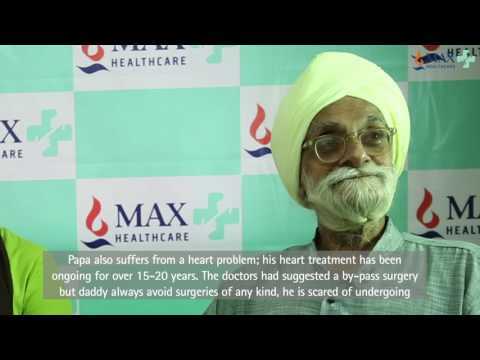 After treatment, Mr Singh feels much better and leads a healthier life. He's back to being a caring family man and can live with ease. It is now possible to detect congenital heart diseases in the fetus with remarkable treatment to the critical heart lesions within the womb. When a routine ultrasound is performed during pregnancy, then a four-chamber view of a fetal heart is performed. Max Multi Speciality Centre, Pitampura offers healthcare services in major medical disciplines including Neurosciences, Orthopaedics, Urology, ENT, Physiotherapy, Dentistry, Aesthetics and Reconstructive Surgery, Obstetrics and Gynaecology, and Endoscopy. It is one of the best hospitals innorth Delhi and offer minimal access surgery (Laparoscopic Procedure) for Gall Bladder ,Hernia Repair, Pancreatic Cysts , Appendicectomy,, Minimally Invasive Gynaecology Surgery as well as advance treatment for Gastro, Opthal & Dental Deptt.. 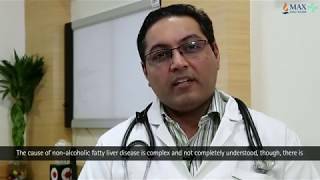 The team of experts at Max Multi Speciality Centre has treated patients across more than 25 specialities making it a highly trusted and reputed hospital in Delhi. To ensure privacy and maximum comfort for our patients, we request visitors to follow the below mentioned guidelines. IPD Rooms - One visitor is allowed to visit the patient between 4:00 pm to 7:00 pm. ICUs - One visitor is allowed to visit the patient between 11:00 am to 12:00 noon and 06:00 pm to 07:00 pm. One attendant is allowed to stay with the patient in Single, Twin Sharing and Suite. Follow the directions of the senior person in charge of each area and/or department if there is an emergency such as fire. Patients are requested to wear hospital dress during hospitalization. Security personnel might check your belongings at any point of time; please cooperate. Be considerate of others present in the hospital. Smoking is prohibited, so please do not smoke. Outside eatables, sweets are not allowed in the hospital premises. Do not bring incense to burn in the patient's room as it may cause a fire or affect the patient's health. Please do not bring flowers, handy cameras, and visitors below 12 years to the hospital. Max Multi Speciality Centre, Pitampura has a team of world class physicians and staff who make sure that the treatment is curative as well as preventive. This facility is known for offering seamless and integrated world class healthcare to its patients. With a strong presence across North India, we believe in delivering world-class healthcare services through our 14 hospitals across 30 specialties. Our experts have treated 2.8+ million patients over 130 nationalities. Our hospitals are equipped with state-of-art Cath labs, OTs with HEPA, LINAC for Radiotherapy and MRI and CT scan machines to ensure that you have access to all medical facilities. This method uses soundwaves to create images of parts of the body to help diagnose and determine treatments plans. It is considered a very accurate and a safer method comared to radiation techniques. X-Ray generator comprises of electrode pair - cathode and anode. X-Ray generator comprises of electrode pair - cathode and anode. When the highly negatively charge cathode rays hit the positively charged anode, large amounts of energy is released which can pass through tissues and organs of the body but not bones which ultimately produces an image of the bones after being reflected. Helps detect potentially treatable blinding eye diseases, ocular manifestations of systemic disease, or signs of tumours or other anomalies of the brain. Fundus cameras consist of an intricate microscope attached to a flashed enabled camera are used in fundus photography. The main structures that can be visualized on a fundus photo are the central and peripheral retina, optic disc and macula. Fundus photography can be performed with colored filters, or with specialized dyes including fluorescein and indocyanine green. It is an eye exam that measures a person's prescription for eyeglasses or contact lenses. Polio had left Mrs. Sarla Latha's left arm immobile, since childhood. Timely surgery helps a 76-yr-old live life well. Since Mrs.Kala Parwani was 15, she had been suffering from knee problems. Obesity had been making life hard for Mrs. Veena Malik for over 6 years. Mr Sahib Singh needed treatment for a large bladder mass and an enlarged prostate. Women Need to Take Care of their Health: Read How! When Cancer Runs in your Family?